There is a silver lining for Thornton following their defeat at Mytholmroyd in the second round of the Parish Cup last Sunday. It means four of their players get a chance to play at Scarborough’s North Marine Road county ground on Sunday, June 17. The Spenser Wilson Halifax League is fielding a select side against the Scarborough Beckett League in a 40 over match on that date, when the quarter finals of the league’s knockout competitions also take place. The clash with the cup means team boss Andrew Pinfield was limited in his selection options for the game on the east coast. He explained: “It is Parish Cup quarter-finals day so some players from clubs such as Warley, Triangle and Booth, who I would have picked, are unavailable. “But it is a good opportunity for others and I am particularly pleased for the Thornton lads. Nikki and Josh Hutchinson, Ross Soames and Ross Parr are the four players from Thornton’s table-topping side to be named in the line-up. The team will be led by SBCI’s wicketkeeper/batsman Simon Wood and there are a couple of non-Premier Division players named in Clayton’s Sam Wilson and 12th man Dominic Anderson from Wibsey Park Chapel. 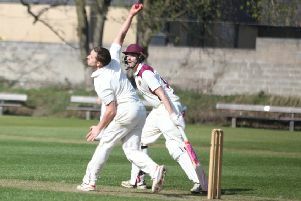 Pinfield is well aware of opening bowler Wilson’s talents, having played alongside him at Jer Lane, while the manager wanted a spinner in his line-up on a big ground and SBCI youngster Henry Lamper fits the bill. The fixture has come about following the scrapping of the West Yorkshire Area Knockout Cup due to a lack of leagues wishing to compete. A Halifax side led by Triangle’s Christian Silkstone won the competition last season, beating the Bradford Evening League by seven wickets in the final at Pudsey Congs. That has given the Halifax League the opportunity to take up a long-standing invitation to play Scarborough. Pinfield was in charge of the Halifax team for last year’s successful campaign and was asked to carry on in the role, even though he now plays for Buttershaw St Paul’s, who have just a third team in the Halifax League. The Halifax League plans to run a 55-seater coach to Scarborough. Transport for the players is free and spectators can travel for £10. Halifax League: Simon Wood (capt & wkt) and Tom Wood (both SBCI), Olly Thorpe, Alex Blagbrough and Alex Rowles (all Copley), Nikki Hutchinson, Josh Hutchinson, Ross Soames and Ross Parr (all Thornton), Sam Wilson (Clayton), Henry Lamper (SBCI). 12th man: Domnic Anderson (Wibsey PC).